Kajal Patel joined Methfessel & Werbel in 2018 following a clerkship with the Honorable Marie P. Simonelli, P.J.A.D. of the Appellate Division. During her clerkship Ms. Patel assisted in the writing of a wide variety of decisions resolving civil, criminal, and administrative appeals. Ms. Patel is a graduate of the University of Illinois College of Law, where she served as the Admissions Editor of the University of Illinois Law Review. During her final year at the University of Illinois, Ms. Patel participated in the Elder Financial Justice Clinic. While pursuing her law degree, Ms. Patel completed a judicial internship with the Honorable Tonianne J. Bongiovanni, U.S.M.J. at the United States District Court for the District of New Jersey and a clerkship with Blume Forte Fried Zerres & Molinari, a personal injury firm. 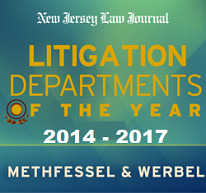 Ms. Patel is a member of Methfessel & Werbel’s Employment Practices group under the direction of Eric L. Harrison. Her practice is concentrated in the areas of employment law, education law, public entity law, discrimination and civil rights.